Watering: With the cooler nights and warm days, it’s important to change our watering routine. For fall, we need to water less often than we do during the hot summer. Typically, once our daytime temperatures reach 85-100 degrees, we move away from our summer watering schedule and move into the fall schedule. There are some major factors that play into how much you need to water; those factors are the type of tree or plant, and the planting location. Check out our watering guide to see what we recommend. If you would like more help, don’t hesitate to reach out to one of our nursery pros at your nearest Moon Valley Nursery location. We need to cut back on the frequency of watering, not the actual amount used when watering. Fertilizing: It’s time to fertilize! Fertilizing helps your trees, palms, and other plants grow to their full potential. This is the perfect time for additional help with the growing process; fertilizers will allow trees and plants to intake more nutrients and water along with making nutrients more readily available. Moon Valley Nurseries has a line of custom developed fertilizers that can be used on a variety of landscape materials – turf, grass, palms, shade trees, desert trees, hedges, and so much more. Click here to see our fertilizers. Tree Care: Make way for new growth! Trim off the dead or damaged branches so that new growth has room to bloom. Fall is the time to use proper tree care to ensure that your trees and plants are ready for the new growth. Want some help? Our tree care team are ready to remove dead or damaged trees or branches; they can also trim all trees and palms in your yard. So, if you aren’t wanting to do the work, let us do it! Crape Myrtle – This tree delivers color! Blooming large clusters of flowers throughout all seasons, the Crape Myrtle will deliver year-round interest of vibrant color. 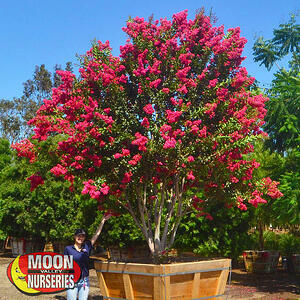 We custom grow our Crape Myrtles to be mildew resistant, making them the strongest Crape Myrtles you can find. With low maintenance needs, low water use, and the variety of colors of flowers, it is easy to see why the Crape Myrtle is one of the most popular flowering tree. 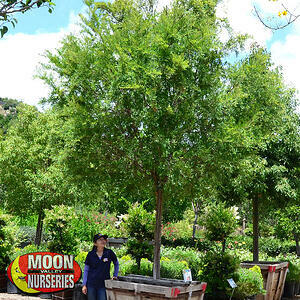 This drought tolerant tree grows in a vase shape, with vibrant flowers popping against shiny, bright green leaves. Chinese Elm – The Chinese Elm, also known as the “Evergreen Elm,” is a favorite staple in many parks and homes, and it is one of our top performing shade trees. The dark green foliage creates an umbrella-shaped canopy that produces mass amounts of shade which we can all appreciate in Las Vegas. The Chinese Elm is ideal for use as a picnic spot, for climbing, or for attaching a tire swing for the kids to enjoy. 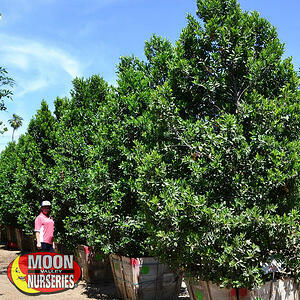 This tree thrives in full sun and is very tolerant of poor soil and poor weather. Moon Valley Nurseries carries the ‘True Green’ strain which does not weep. Carolina Cherry – The Carolina Cherry has become a popular choice due to its minimal maintenance, natural upright conical shape, and ability to tolerate heat, drought, and wind. This is a small to medium-sized evergreen with dark green, lustrous wavy-edged foliage on thorn-less stems. Carolina Cherry trees make great privacy hedges as they can be sheared into a tall screen or kept in their conical shape. Plant them in rows to create a lush living wall. Piru Queen Palm – Our Piru Queen Palms feature thicker and harder trunks, denser and greener fronds, and fuller crowns. These evergreen palms thrive in full sun, heat or cold exposure. Very low water requirements make this ideal for anyone trying to conserve water while having a lovely landscape. Our Piru Queen palms will bring the feel of the tropics straight to your yard. 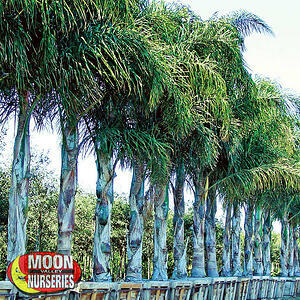 These beautiful palms can grow up to heights of 35 feet and can have 10-15-foot fronds. Plant in your front yard for a focal point and use nighttime lighting to pump up the wow factor! Pygmy Date Palm – Its versatility and dwarf growth pattern allow the Pygmy Date palm to be planted in tight spaces. Pygmy Date palms can be grown in shade, are slow growing, and the roots are non-invasive. 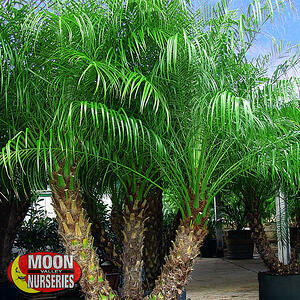 This allows it to be a fantastic option for planting under larger palms, in between palms, in a pot, or in a cluster. This stunning palm features multiple trunks of varying height or a single trunk. 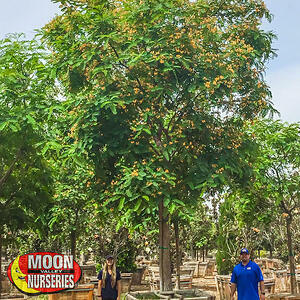 Moon Valley Nurseries custom grows our Pygmy Date Palms, at our local farms, to ensure that the palms develop thicker trunks and fuller crowns; giving you the greatest quality palm.